Kestrel — Dianna Tyson spent the early part of the war, not on the front line, but in the engine room. She worked tank, and land vehicles but her true expertise was found when tuning airships, at the heart of the machine, the diesel engine. However, like so many of that unappreciated profession aboard old air diesels, she was subjected to cramped, dark, loud conditions and the diesel fumes. She was recommended for section 8 discharge after becoming social…with crew members that weren’t there. The records of this discharge were destroyed by the upper ranked brass. No matter how dangerous she got for her allies, she was far too valuable an asset and too deadly to their enemies to be shelved away. 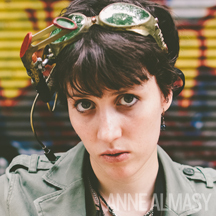 Prior to her service in the squad Dragonfly, Dianna was a mechanic aboard the airship Leaping Lady Lyra. While on patrol her ship was lost with all hands, or so it was believed. Waiting for the rescue that would never come, she survived by setting ambushes with jerry-rigged explosives and hand to hand surprise attacks. One fateful day she nearly killed Captain Hawk after mistaking him for the enemy. Upon experiencing her ferocity and expertise firsthand, Hawk recommended her addition to the squad. Now serving as demolitions expert and combat mechanic when needed, Major Kestrel has demonstrated a disturbing affinity and yet great proficiency with explosives (sometimes to the point of her squad mates dismay). “I just love…surprises! I love the sound..and that smell! Oh that BOOM! !” In addition to being as unstable as the explosives she uses, the major was nicknamed Kestrel because of her signature killing move. She first hides out in small spaces above her intended prey. Once in range she jumps down tackling the enemy leader whist simultaneously setting off the explosives that kill their fellow soldiers. Major Kestrel uses a personally modified Spitfire pistol and a sub machine gun packed with explosive shells she’s dubbed “Carnage” to take down any foes not already blown to bits from her explosions. In real life — “Kestrel” is Morgan Daniel, a massage therapist for a chiropractic clinic in Buckhead, GA. In her spare time she enjoys drawing and painting as well as making costumes and weapons.